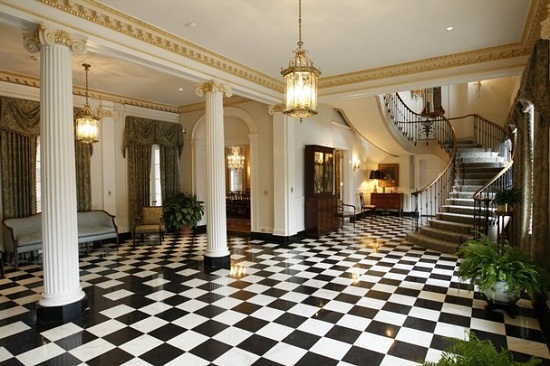 Black And White Vinyl Floor Tiles – With checkerboard floors, your options are endless. But, if you are looking for more classic, sophisticated and retro look, then choose the black and white vinyl floor tiles. Durable, strong and affordable vinyl tiles, great for kitchens, bathrooms and any other room that needs to withstand heavy activity. Go out of the box and choose more creative tile pattern for your home. Choose the amazing black and white vinyl floor tiles. Vinyl Wood Pattern – If you are looking for a classic and clean pattern, then choose the vinyl that mimics real wood. The vinyl wood planks look exactly as the real wooden planks. You need to get down on your knees to spot the difference. The similarity is stunning. The vinyl wood planks are ideal solution for offices, retail stores, etc. Perfect for those who want to make their home warm and comfy. Vinyl Stone Pattern – With vinyl you can never run out of ideas. Why spending so much money on real stone, when you can have the same look with the vinyl stone pattern. Just pick the style and the texture you like. You will find a wide range of stone designs available in planks and tiles. You just need to choose the pattern that matches your taste. Vinyl Concrete Pattern – The vinyl tiles can replicate concrete as well. Unlike the black and white vinyl floor tiles, the concrete pattern gives more clean and elegant look to your home. This vinyl type is ideal for living rooms, bedrooms, kitchens, offices and meeting rooms.